It is extremely difficult to spot your favorite runner on the course, unless he or she is in the top 300. After that, the crowds get quite thick, everyone looks the same, and it's very difficult to project when your runner will come by, as you don't know when they started. What works MUCH better is if your friend finds you. Tell them EXACTLY where you will be (i.e. on the runner's right on Fifth Ave just past 117th St.), and they will likely find you. Consider carrying a distinctive mylar balloon on a long string so they can spot you from a few blocks away; this works brilliantly. Download the runner tracker to get a sense of when your runner will be passing by. A. Long Island City (approx 13.5 miles) on Vernon Blvd. and 47th Rd. (on the left-hand side of the runners, in front of Woodbines), a few blocks away from the Vernon/Jackson stop on the 7 train. B. After they saw me there, they took the 7 train towards Times Square and switched at Grand Central to the Lexington Line Uptown 6 local to 110th St and met me on the northwest corner (runner’s left side) of 110th and First Avenue (Mile 18). They go to 110th because First Avenue is very, very crowded lower down, particularly around the streets that correspond to subway stops. Consider going even further uptown. C. Then they walked across 110th St and met me on the northeast corner (runner’s left side) of 110th & Fifth Avenue (Mile 23). The good part of this arrangement is (1) Long Island City is less crowded and easy to get to - the meeting spot is very close to the subway station, and (2) It allows for three spots; your runner REALLY appreciates seeing you at Mile 23, and it's a great place to see the stress that most runners endure completing a marathon. Also, if you see your runner at 110th St., you can then walk over to the B/C train at 110th St. and Central Park West and take it downtown to meet your runner on Central Park West, likely around 81st St. The bad part is you have to move fairly quickly to get from stop 1 to 2; if the runners runs a 9 minute pace (4 hour marathon), it's only about 38 minutes, and you have to take the 7 train, switch to the 6 train, then walk 3 avenues east; but it is entirely doable, my family has done it 3x, with kids in tow, and never missed me, and I did it last year in support of a friend and got to the First Ave spot way before she did. A less ambitious plan would be to see your runner in LI City and then take the 7 to the R train in Times Square; then take the R uptown to 59th and Lexington, walk up to 6th Avenue and watch your runner in Mile 25 along Central Park South; then it will be about a one-mile walk to where your runner exits the park. You might also consult the official spectator guide. Your marathoner may need nothing other than a big smile and a few words of encouragement. There is a reasonable chance they will have a desperate look on their face, praying that you have whatever they need. It may be (in order of likelihood) Vaseline, pretzels, a band-aid, an extra gel pack, something to sip that does not taste like lemon-lime gatorade, a hat or gloves, a fresh pair of socks, $20 or a metro card, etc. Be prepared, and you'll be a hero if they need you, but know they probably won't, and don't be insulted if they just blow by you. #4 Please don't tell runners they are "almost finished" unless you are at Mile Marker 26. A few years ago, I was watching the race at Mile 23, and a couple next to me asked out of the blue, "how many marathons have you run?" I asked, "How did you know I've run marathons?" The wife responded, "because you're not saying 'you're almost finished.'" The three of us then launched into a diatribe about how dispiriting it is to hear that so many times in the last six miles. When you seriously doubt you can make it 50 more yards, being 3 miles away from the finish line is NOT "almost finished." In the first half, everyone's doing great, and anything goes; but once runners pass halfway, they begin to suffer, and appreciate encouragement such as "you look great," "hang in there," "finish strong," "keep rolling." They do not appreciate "you're almost finished," or "gosh, there's ONLY 7 miles to go." Now that you know, if you get a death stare in response to such a comment, you deserve it. #5 If you are crossing the race route at any point, PLEASE do not walk directly across the route, and do not cross in a pack. Cross diagonally, alone. Crossing straight across the street is extremely dangerous for you and the runner, as they do not see you until they are right on you; I have seen quite a few wipeouts as a result of this behavior, including one that cost an older woman a Starbucks latte grande and a lot of dignity. When you do this in a pack, you are all but guaranteed to seriously impact a runner. Instead, begin walking - ONE by ONE - in the direction of the runners, and gradually move over. There are plenty of runners walking on the side of the course, so a spectator doing so is not a disruption. Walkers and runners also drift sideways in the latter parts of the race, so again, you walking and gradually getting over is not a serious disruption; done right, it is almost seamless. #6 Know that, for most runners, the race is physically and EMOTIONALLY exhausting and unnerving. Treat them gingerly at the end. When my friend - a 6'4" 210 lb basketball player - ran his first marathon, his fiancee greeted him at Mile 25 with a very enthusiastic pat on the back. It sent him sprawling to the ground. In ordinary circumstances, she could leap into his arms and he would swing her around. At Mile 25, a pat on the back was enough to knock him down. It's the same emotionally; the runners are elated, but they may also be emotionally trained after weeks of anxiety, with an avalanche of competing emotions washing across their drained psyche. I've seen many runners burst into tears after crossing the finish line. One of my running partners - a lifelong friend - went from yapping the whole way to suddenly going very silent, unable to engage in any conversation at all; she was literally stunned by the whole experience, and that wasn't even in NYC. Others may be despondent over missing their time goal. Be positive, tread lightly - If they're upset at missing a time goal, don't tell them they are silly for feeling that way; they won't be ready to hear that for weeks. Say, "I'm sorry you're disappointed, but I am so proud of you." Follow your runner's lead. He or she may be just fine, but be judicious in your comments and questions until you know that's the case. #7 Plan to celebrate when it's all done. After I finished my first race, I went home, thinking I'd be exhausted to do anything else. After recovering, I spent the rest of the night eating and drinking and talking to friends about the race on the phone for hours, wishing I had instead just met them all at a bar. We did that the second year, but had no plans, and ended up schlepping in a big group around a very crowded midtown area trying to find a table for 14. This was painful. Reserve a great place NOW to have a terrific celebration, and make your runners WEAR THEIR MEDALS proudly. The Distillery is at 52nd and Ninth – about a kilometer from the finish line. It has great food, terrific cocktails and craft beers, and a great ambience. They had a blowout bash last year, full of runners and their families all day and night. Closer to Penn Station (take the 1 train downtown to 28th St) is Mustang Harry's, a large facility that will be showing all your favorite sports teams, has an excellent line-up of drinks and a solid menu of comfort food. Call them at (212) 268-8930 or reserve on Open Table. 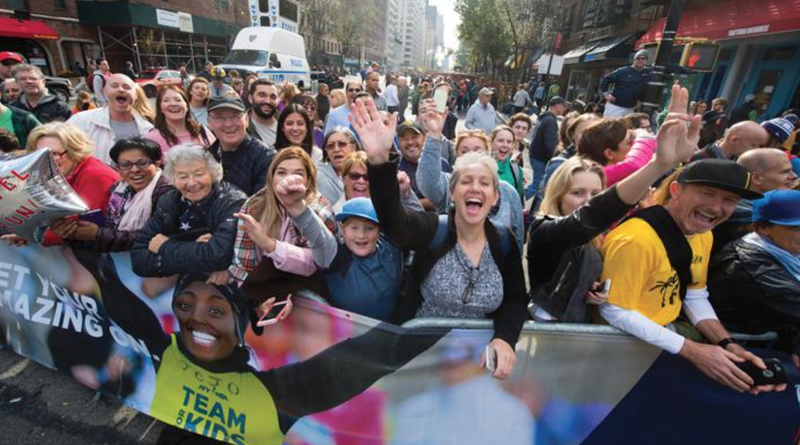 Running the NYC Marathon is one of the great experiences in a lifetime. The race doesn't end when your runner crosses the finish line. After my first race, I woke up at 3 am every night for two weeks, wondering if I had really just done that. Be patient, know that this is their time, and let them enjoy it and relive it, and plan to do something equally fabulous yourself.